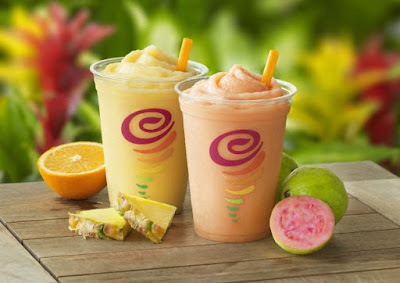 Jamba Juice looks to entice you this summer with new Island Getaway Smoothies featuring tropical flavors like guava and pineapple. The new seasonal smoothies come in two flavors: Gotta Guava and Tropical Sunburst. - Gotta Guava features a blend of guava juice, peaches, sherbet with pineapple, and strawberries. - Tropical Sunburst consists of fresh orange juice, pineapple juice, pineapples, and sherbet with pineapple, blended together. Additionally, Jamba Juice has added the new Strawberry Juice Refresher to their Fresh Squeezed Juice line. Strawberry Juice Refresher includes fresh apple juice, strawberries, and lemon juice. To encourage sampling, the juice and smoothie chain has an online coupon for a $2.99 small (16 ounce) Island Getaway Smoothie good at participating locations through June 1, 2016. You can find the coupon on their website here.